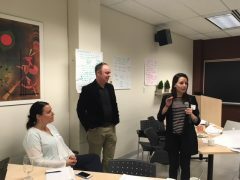 Spring 2019: Community Campus Engage Canada is changing! Community-Campus Engage Canada (CCEC) was formerly a working group of CFICE (see information on CCEC’s history below). As of May 1, 2019, CCEC operates under the umbrella of the Trent Centre for Community-Based Education. Through the regional roundtables and the national roundtable held in June 2018, stakeholders provided thoughtful and constructive reflections about the CCE landscape and hopes for their national network–CCEC. Later in 2018, we hosted a national meeting in November in Montreal to begin building CCEC. Two committees emerged from this meeting, an Interim Steering Committee and an Interim Executive Committee, to steward CCEC forward until April 30th, 2019. Specifically, the committee work involves finalizing the strategic plan and governance framework, developing a work plan, pursuing resources to sustain CCEC and communicating with the broader CCEC membership. We’re so pleased to share CCEC’s Strategic Plan with you: CCEC Strategic Plan (March 2019). Join us for our upcoming webinar, Weaving Indigenous Wellbeing, Research and Ethics: Community and Campus Perspectives in Canada, on April 25 at 12noon EDT to learn how we can grow impactful Indigenous-Campus engagement and ethical research in Canada to better support indigenous community health and wellbeing. Subscribe to our mailing list to receive updates on CCEC’s progress (if you already signed up on our initial “Join Us” page, or you have subscribed to CFICE’s newsletter in the past, you have been automatically added to the CCEC mailing list). Participants present at the CCEC’s last National Roundtable in Ottawa, February 2018. Community-Campus Engage Canada (CCEC) was formerly known as the Aligning Institutions for Community Impact (AICI) working group. It was one of the five working groups in Phase II of the CFICE project. CCEC has become the living legacy of the CFICE project as an emerging national network and community of practice focused on strengthening Canadian communities by increasing the capacity, infrastructure and impact of equitable community-campus partnerships of all types, including student experiential learning, community-engaged research, and social innovation. It focuses on shifting institutional cultures to break down barriers, and foster collaboration at post-secondary institutions (PSIs), community-based organizations (CBOs), funding agencies (including governmental bodies and private foundations) and other networks. In doing this, CCEC aims to promote and sustain nation-wide, positive social change and impact to strengthen ‘Community First’ community-campus engagement (CCE) in Canada. The CCEC working group was originally made up of CCE practitioners, faculty and civil society leaders from across Canada. The Working Group supported partners in negotiating administrative challenges in CCE as well as augmenting and fostering equitable distribution of CCE grant funding and supports. Following a series of regional and national roundtables that the CCEC working group convened to collaborate with grassroots partners, engagement practitioners, post-secondary institutions (PSIs), policy makers and funders, CCEC began to work towards becoming its own entity with the objective of building a sustainable community of practice for community-campus engagement (CCE) in Canada. This work included developing an Interim Executive Committee and an Interim Steering Committee tasked with pulling together some key governance pieces for establishing the CCEC as an independent organization. What are CCEC’s current goals? Establish a Canadian CCE network and community of practice to connect community engagement practitioners and campus engagement initiatives across Canada to share and develop CCE best practices, research, and resources. Convene high-level discussions among funders and university partners to advocate for funding policies and practices that better support and reward Community-First CCE.